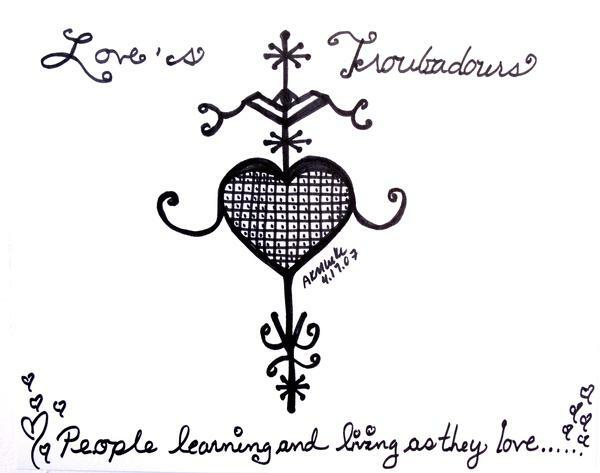 Love's Troubadours is a Lorraine Hansberry-inspired novel series about people learning and living as they love, by Ananda Kiamsha Madelyn Leeke. The first book in the series is Love's Troubadours - Karma: Book One (2007). It tells the story of Karma Francois, a thirtysomething Oakland-born BoHo B.A.P. (Bohemian Black American Princess) with Louisiana roots and urban debutante flair. The novel begins with Karma's life in an uproar. Her relationships and the museum curator career that she struggled to form in New York City have crumbled, leaving no viable options to rebuild. Relocating to Washington, DC, Karma struggles with denial, depression, and debt. A lack of full-time employment opportunities forces her to craft a gypsy existence as a Jill of Many Trades: yoga teacher, art consultant, and freelance curator at Howard University Gallery of Art. Unable and unwilling to appreciate these jobs as gifts, she wallows in a pool of lost identity-and doesn't see a way to keep from drowning. When she looks in the mirror, Karma sees a woman whose choices have dishonored her true character. Now, for the first time in her life, Karma must learn to see herself for who she really is. To purchase a copy on Amazon.com, click here. Be sure to visit the Love's Troubadours Pinterest board.